A little time, a whole lot of compassion. We come at our work with limited time (there is always more to do for animals and the people who love them! ), but with unlimited compassion. Once in a while we wonder if it’s enough, if it’s making a difference. And we always realize that it is, that in fact this is all we need to do to make a difference. Lives are changed for the better, proving to us that big results are born out of consistent care and hard work. For example, recently at the weekly Woof Wednesday at our Pet Resource Center, a man named Gregory brought in his dog Trouble to see our counselors. Gregory wanted to make sure that Trouble was healing properly after being neutered almost two weeks ago in one of our mobile clinics for the Skid Row community. After speaking with us for a bit, Gregory began feeling ill and ended up passing out in our lobby at the Inner City Law Center (ICLC). It was scary to say the least, not knowing Gregory very well, or whom to call on his behalf, or even where he lived. We knew he might have to go to the hospital, and that Trouble would need to go somewhere to be kept safe. The caring staff at ICLC stepped up and offered to let Gregory sleep at the office for a bit. After some time, he slowly woke up from what we now know was a bad reaction to medicine, something that could happen to anybody. It became apparent that Gregory really needed help. So we sent Trouble to the North Central Animal Shelter with Dominque, a LAAS staff member who is at our center every week, in order to keep him safe. Some of you may not agree with taking a dog to the shelter, but in this case the shelter was a secure place to keep Trouble until we were able to figure out what would happen to Gregory. And we could keep an eye on him there. The next day, Gregory returned to Inner City Law Center. Two of their staff members drove him up to the shelter to redeem Trouble. 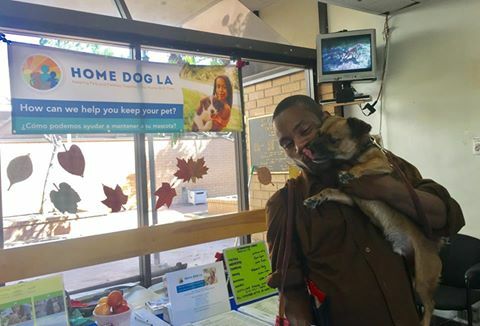 Our dear friends at Home Dog LA were set up as they regularly are, ready to help navigate Gregory through the paperwork process for redeeming Trouble as well as paying for the fees to bail him out, something Gregory could not afford. Trouble went home less than 24 hours after he had come in to the shelter! Pet Resource Center – coming to Skid Row on July 13th! Unique partnerships are often at the core of our work, for we cannot accomplish our mission alone. Innovated, new approaches must be created in order to help animals and the people who care about them. That is why we’re happy to tell you about our latest partnership with Inner City Law Center (ICLC) and Los Angeles Animal Services (LAAS), which is focused on providing an easily accessible Pet Resource Center on Skid Row on July 13th. Inner City Law Center is a non-profit law firm providing legal representation for the most vulnerable individuals and families in LA who have now where else to turn, regularly combating slum housing, preventing homelessness, and aiding homeless veterans. 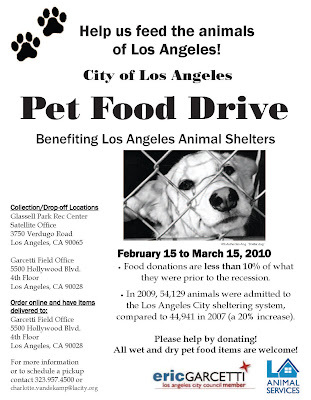 Los Angeles Animal Services is on of the largest animal shelter systems in the United States, managing six shelters and a high volume of pets. Put them together, and that’s a lot of power we’re lucky to align with. It means we can make a bigger difference. At DDR, we believe that what is inside a person’s wallet should not be what determines whether they are a loving pet owner, capable of providing care and kindness. We’ve witnessed firsthand how many people living on the streets often rely on their pets for emotional support and companionship, as well as the number of low-income families struggling to pay rent, never mind caring for beloved family pets. Our Pet Resource Center on Skid Row will provide resources and services so that this community is better able to care for and keep their pets. By enabling more families to stay housed and connected, we hope to prevent fewer pets from entering the shelter system and fewer unwanted litters from being produced. We are so excited about this partnership and the impact it is sure to make. For starters, it gives low-income residents of Skid Row a place to go when they need help with their pets. Many individuals experiencing homelessness or financial hardship are unaware that resources like us even exist. More over, many struggling fear seeking help, assuming it will lead to their cherished animals being taken away from them. We know that no matter what a person’s housing or financial situation may be, there are ways to keep pets with their people, and keep them all safe and happy. they were prior to the recession. compared to 44,941 in 2007 (a 20% increase). All wet and dry pet food items are welcome! Saturday, I volunteered with the Amanda Foundation Team and LA Animal Services, to do another 100 Dog Day called “Pits and Pals”. The event took place at the North Central Animal Shelter. In the pouring rain, dog owners still showed up and we had a great day. Free spay and neutering is so necessary and these 100 dog days type event, which focus on the two breeds that are most often in the City shelters, Pit bulls and Chihuahuas, help to get the word out about the mobile clinic program. The Amanda Foundation’s mobile spay/neuter clinic is the most successful in the nation. We are very fortunate to have such a great program in the City of Los Angeles. To donate please visit AMANDA FOUNDATION. To volunteer for a DDR spay/neuter clinic, please contact me directly Lori@Modernica.net We always need volunteers and product donations.